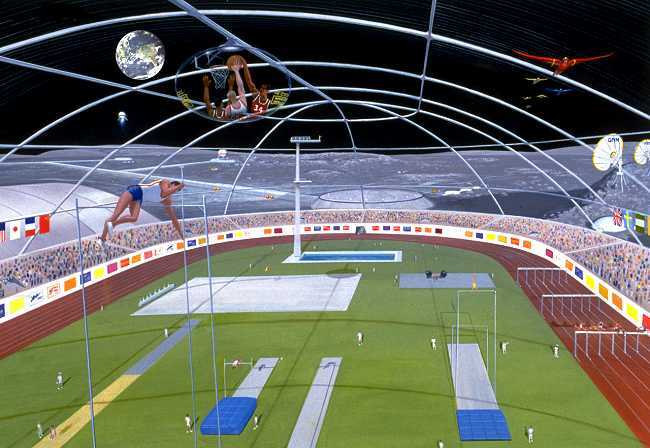 According to this site, NASA produced a public domain painting representing what the Olympics could look like on a lunar colony. In the upper right of the picture, there are people flying by flapping wearable wings. Given Moon's gravity with Earth's atmospheric pressure in a lunar colony dome, like the one shown here, could this be possible? How much force would you have to push down on your arms to take off? Would taking off be feasible, or is just gliding? The lift force you would need to produce would have to be equal (stable flight) or greater (take off) than the force pulling you back towards the moon. If your mass is average for a male at 62kg, the force from the lunar gravity would be F=ma, = 62kg x 1.622m/s2 = 100N (almost exactly). This is as far as you can really calculate without specifying shape/size of the wings etc. However this site shows that the human arm can exert around 50N -60N (that's per arm). So with the correct design it seems like you have 1.1 times the required force available. This all ignores the mass of the wings themselves, the percentage of force that is applied in the appropriate direction etc, it at least implies you would be able to hover on the spot until you get tired. I suppose doing so would become comparable to the world record for treading water - after 85 hours you'd be pretty bored. This is a bit late but there have been claims that humans could fly by wing flapping on Titan. The Moon has a surface gravity of 1.62 meters per second squared, or 0.1654 gravity. Titan has a surface gravity of 1.352 meters per second squared, or 0.14 gravity. The surface gravity of Titan is acutally only 0.85 that of the Moon, or the surface gravity of the Moon is actually 1.176 that of Titan. Thus at a rough guess any flying area on the Moon might have to be pressurized with 1.175 the atmospheric density of Titan's atmosphere, which is already significantly denser than Earth's, in order to be equally flyable. Thus the lunar flying area might need air too thick for humans and they might need breathing apparatus to fly by flapping their wings. Not the answer you're looking for? Browse other questions tagged the-moon crewed-spaceflight colonization humans myth-busting or ask your own question. Why is it so hard to walk on the Moon? Do only Eagles walk on the moon? How fast could a person run on the Moon? What is the most valuable (potentially useful) man made object on the Moon? Could we fly on the Moon in Xenon? Could you launch rocks from the Moon to hit Earth? What is the maximum atmospheric pressure a human can tolerate?